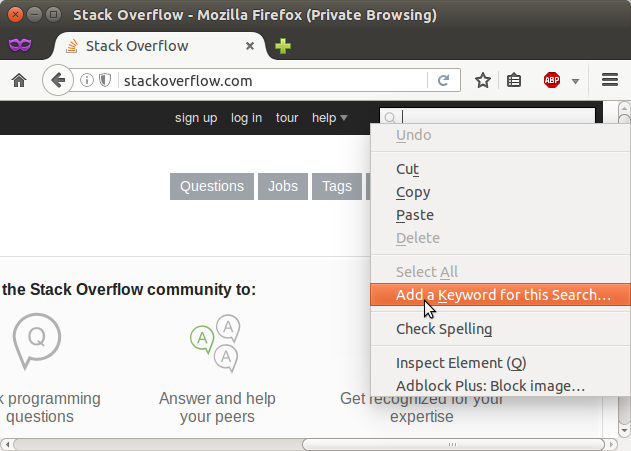 How to add a custom search engine to Firefox? Is there a way I can add a custom search URL to the Firefox search bar? e.g. I'd like to provide a URL such as http://blahblah.com?search=%s, where Firefox replaces the %s with the content of the search box. Both IE and Opera can do this, but I can't figure out how to set it up in Firefox. For example, you can set up your browser to search for bread at stackoverflow.com by simply typing so bread into the omnibar. Do this by right-clicking on the search bar on the website you commonly search. You can do this for the Search field on any website. I'd like to provide a URL such as "http://blahblah.com?search=%s" where Firefox replaces the %s with the content of the search box. You can do this with Firefox! Add a bookmark with that URL, where %s is the search query, then simply set a keyword for the bookmark. You can then search using <key> <search term> in the address bar. For example, the bookmark http://www.google.com/search?q=%s with keyword g means you can type g stack overflow in the address bar to search Google for "stack overflow". Alternatively, go to the site you want to search, right click in the search box and click "Add a keyword for this search". The Add to Search Bar extension lets you create a new search addon with just a right-click. Your best bet is to go to the Mycroft Project and search for an already made search engine plugin. If you can't find one you can create your own on the submissions page. Full instructions are available. Ready2Search is also an available free service that helps you do this for any site. It makes search plug-in for Internet Explorer, Firefox, Chrome, and Google Toolbar with great customization options (icons, query parameters, etc.). Quick search in a nutshell, allows you to turn a typical routined web search process into a command line shortcut. For example, instead of going to wikipedia.com to enter the search terms there, you can use “w mySearchTerm” from Firefox’s address bar. Choose "Add a keyword for this search." Search by inserting "mysrch yourSearchTerm." in Firefox's address bar. It's as simple as right clicking in a search field. The other advantage is that this process creates a bookmark for you. If you use something like XMarks to synchronize your bookmarks, you can access the same search functionality across all synchronised computers. Instead of creating it manually you can use a service like Searchplugins.net which provides an online form to generate your custom search plugin. Search for the word "TEST" in the search engine of your choice and copy/paste the resulting url to the form. eg. Fill out remaining info / click "create plugin"
Click "Install" which appears above the form. The plugin will be added to your search bar. You can also make complex searches with multiple parameters, and here’s how. I choose “,” as the separator, but it’s just an example. It’s perfectible, but you get the idea, and anything is possible. A bit late to the party, but for those finding this thread now you can click the search icon in the search bar when on the site you want if it has a green + icon on it. Open a web page that has a search on it (e.g. MDN: developer.mozilla.org). In the address bar, find the icon with the three dots (for me, it’s on the right end of the address bar) and click it. Click “Add Search Engine”. This adds the web page’s search to the search engines in your preferences. In the table under the column for “Keyword”, double-click in order to set your own keyword. I believe he's referring to keyword.URL in Firefox's about:config page. In Firefox's address bar type about:config, then search for keyword.URL and replace its contents with "https://blahblah.com/search?q=", for example. Not the answer you're looking for? Browse other questions tagged firefox search or ask your own question. Firefox adding my own URL as my search engine? How can I customize Firefox's search engines? How can I add “Search with Wikipedia” to my Firefox right-click menu? How do I edit the name of a custom search engine in Firefox? How to configure the search bar over the most visited sites on the “new” page in Firefox? In the navigation bar, how to use shorter words to indicate the search engine? How to add search engine using Firefox's address bar?